Novotel Deira City Centre Dubai - Dubai Hotel Located in Dubai City Centre, Dubai Shopping Area and Dubai Business District! This Dubai hotel is located in front of the City Centre Mall. It is a 5-minute drive from Dubai International Airport and has a pool, a gym and a restaurant. This stylish and modern hotel offers large and beautifully decorated rooms with a 26-inch LCD TV, a tea/coffee maker and a minibar. The Novotel also has a temperature-controlled outdoor swimming pool and a modern gym. Guests of the Novotel Deira can enjoy international dishes at the restaurant. The hotel also has a café-patisserie that is open 24 hours a day. 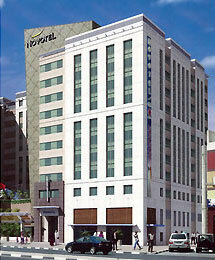 The Novotel City Centre is a short drive from Dubai World Trade Center.